We were out bright and early this morning, to catch the sunrise from up on the ridge behind Roachside Cottage. It was gorgeous! We saw just one person; a photographer, one of the regulars I think, all muffled up in his duvet jacket and mittens. He’d probably been there since total darkness. We didn’t speak. These chaps are often bent over their cameras, adjusting and twiddling – best not to interrupt them sometimes. We see their beautiful compositions on the “Roaches Appreciation Society” Facebook page. They are all very talented and obviously very driven, to get up here well before the first glimmering of sunrise. We yomped along over the ridge to Roach End and returned along the road. Near the Merebrook turning, a rusty old van was perched perilously on the embankment. It was the local drystone wallers. They are two blokes of late middle age who seldom speak, other than a cursory “Tow reyght? (a good North Staffordshire greeting which translates as “Are you well?”). Theirs is spartan existence. Up in the cold and drizzle, in the wind and the frost. No amenities here. Wrapped up in countless layers of jumpers and coats, they barely speak to each other, each instinctively aware of what the other is doing on the opposite side of the wall. Just the sound of the sheep up on the hillside and the periodic chipping with a brick hammer to sculpt an unruly chunk of stone into submission to find its place in the slowly growing wall. Later in the day we called round at our neighbours along the road and, unable to resist another wander out in brilliant sunshine, carried on back towards Clough Head and The Hanging Stone. As we sat on the ridge above Clough Head, a Moke (one of those cross-country buggies used by hill farmers) trundled along the path below us, leading a line of cattle being brought to fresh pasture from their summer nomadic existence on the moor. In the stillness of the late afternoon, with almost no wind, the sound of the cattle plodding along, the occasional “c’mon” or whistle from the two young stockmen combined to fill out a picture of a wonderful autumn day on the Staffordshire uplands. We came back all the way along the ridge as the sun dipped to the horizon and the moisture in the air started to condense into a milky veil below us. These are the days we remember forever. 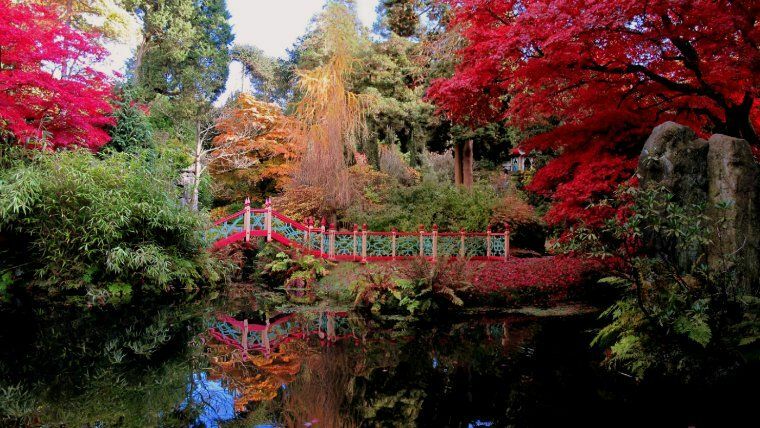 The National Trust’s Biddulph Grange garden is about 10 miles from Roachside and not far from where we live. We called in there a couple of days ago to see it in its autumn splendour. It is one of the great jewels of the NT’s collection of important gardens and, as the winter draws near, it explodes into its autumn colours. This amazing Victorian garden was created by James Bateman for his collection of plants from around the world. A visit takes you on a global journey from Italy to the pyramids of Egypt, a Victorian vision of China and a re-creation of a Himalayan glen. Its masterful design allows you to enter into a country cottage and come out the other side from an Egyptian temple! The garden features collections of rhododendrons, summer bedding displays, a stunning Dahlia Walk and the oldest surviving golden larch in Britain, brought from China in the 1850s. 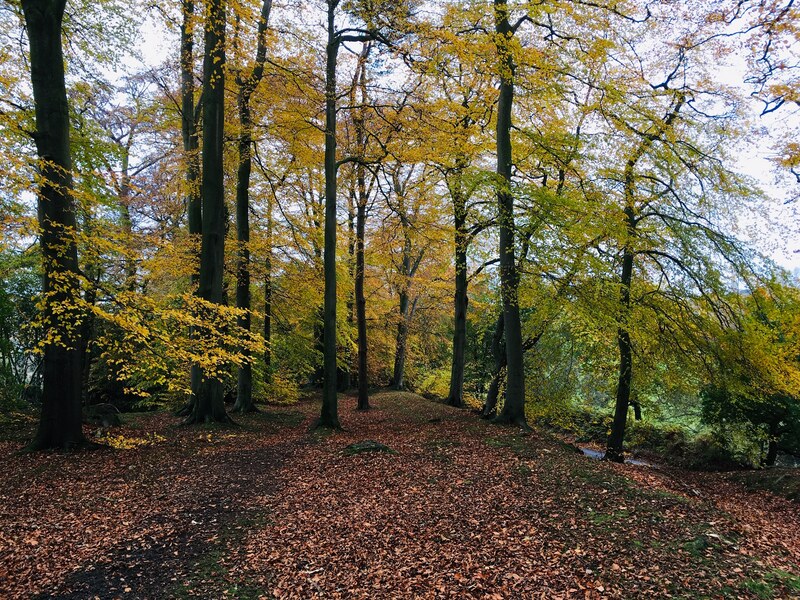 …and when you’ve been all round the world in the garden, you can have a cracking dog walk through the adjacent woods of the Biddulph Country Park.